RANCHO PALOS VERDES, CA-- Having a multi-million dollar view was nothing for Ocean Trails. When the first golfer finally tees off on No. 18 sometime this year it will officially be the most expensive hole in the history of golf. This is a tale of the lost fairway. Ocean Trails was preparing for its grand-opening festivities when a landslide on June 2, 1999, sent its 18th fairway sliding into the Pacific Ocean. The cause of the slide is still in litigation, but a course-commissioned investigation concluded a leaking sewage pipe trailing beneath the 18th fairway was the problem. Los Angeles County sewage department officials disputed that finding, saying the pipe was intact, but needless to say a lot of hearts were broken on that day. Now, almost three years later, eager golfers are still waiting for a chance to play that now-famous No. 18. Building the course will better $130 million � about $110 million more than average for an upscale daily-fee course. The 18th hole will exceed $20 million allowing Zuckerman to exclaim it's the most expensive golf hole in the world. Zuckerman also says when finished, the 18th will be the most stable piece of coastal land in the state. Thinking way ahead, he says, it will still be there in two million years. The Big One, the anticipated, foreseen great earthquake of the LA Basin, might just prove that a risky prediction. 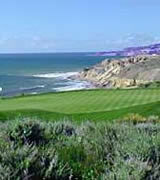 Golfers might just have to swim 19 miles out to Catalina Island, which looms in the distance on clear days. Despite the problems, Ocean Trails is worth it. Just spending a day here enjoying the views, soaking up the warm southern California sun, being lucky enough to see the plume of a passing gray whale, or dolphins at play, has been enough incentive to keep them busy despite a portfolio of only 15 playable holes. Van der Goes said there has been a lot of curiosity because of all the publicity the slide received, but he was apprehensive about opening with only 15 holes. Aside from the ocean views from every fairway, Dye's layout has been a hit, even though it is squeezed into a smaller space of land. There's not even a driving range on the property. The snake-like route you take today includes Nos. 10 and 11, then 1-8 and over for 13 through 17. If you can hit the ball straight and read the slick, lumpy Dye putting surfaces, (did he bury an elephant under some of these?) you can score on this course. Most likely you will record some three putts, but if you play all day and finish 30 holes you might just start making some putts. The fairways can be narrow and many feed into the deep bunkers. The ultra-exclusive, expensive land on the Palos Verdes Peninsula, was owned by the Zuckerman's father and has never been developed. It has, however, been a public access area with hiking and jogging trails and access to the beach below the bluffs. Seventy-five homesites will also be part of the property's future. 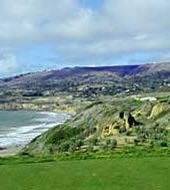 Amazingly, it is the first and only ocean-front golf course in Los Angeles County -- the nearest Pacific Ocean layouts are north to Sandpiper in Santa Barbara and south to Pelican Hill in Newport Beach. 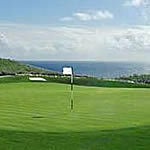 The Zuckermans also contend it is the only golf course in the USA that has ocean views from all 18 fairways. Green Fees: $99 special, play all day, ParView GPS system. Call for details and twilight fees. Rates will change when all 18 ready for play. Directions: Ocean Trails is located at One Ocean Trails Drive and can be reached either from Palos Verdes or San Pedro. From Palos Verdes, take Hawthorne Boulevard directly to the ocean and turn left at Palos Verdes Drive South. It is about four miles to Ocean Trails Drive. From the end of the Harbor Freeway in San Pedro, travel west on Gaffey Street to First Street and turn right. At Western turn left and follow to 25th Street and turn right. Continue on 25th Street until the name changes to Palos Verdes Drive South. Turn at the second left into Ocean Trails. You probably have already seen Ocean Trails on TV. Michael Douglas and Friends is an annual made for television event played at Ocean Trails. The first event was broadcast on ABC Wide World of Sports on April 11, 1999. Players included Michael Douglas, Kevin Costner, Jack Nicholson, James Garner, Will Smith, Chris O'Donnell, Andy Garcia, and Cuba Gooding Jr. The year 2000 event was held at Ocean Trails on March 18. The event featured celebrity players Michael Douglas, Kenny G, Andy Garcia, Thomas Gibson, Kyle MacLachlan, Chris O'Donnell and James Woods. Tiger Woods has also filmed a couple of commercials here. Just a few minutes away from Ocean Trails is the Hilton Port of Los Angeles-San Pedro. It's right next to one of the busiest international ports in the world and the bustling waterways of the picturesque harbor town of San Pedro. Nestled in the foothills of the Palos Verdes Peninsula, the town of San Pedro has the feel of a Mediterranean fishing town, complete with fishing boats and terra cotta-roofed houses, sandy beaches, spectacular cliffs and miles of rugged coastline. The Hilton Port of Los Angeles-San Pedro's idyllic location in the picturesque Cabrillo Marina, only a five-minute stroll from peaceful Cabrillo Beach is perfect for business or pleasure. © Copyright 2019 dosvecesbreve.com All rights reserved.